England have retained out-of-form opener Alastair Cook in an unchanged team for the third Test against Pakistan at The Oval. Vice-captain Cook has hit only 100 runs in his last seven Test innings, leading to doubts over his Ashes squad place. But selector Geoff Miller backed Cook, saying: "Alastair's a battler and he'll battle his way through it." Andrew Strauss's men lead the four-Test series 2-0 following victories at Trent Bridge and Edgbaston. The majority of the hosts' top order have shown good form, but left-hander Cook's struggles have become increasingly pronounced. The Essex man has made only 41 runs in four innings during the series, with time running out to prove his worth to selectors ahead of the start of the Ashes in Australia in November. Had Ian Bell not been ruled out of the reckoning with a broken metatarsal, Cook's position may already have become untenable. 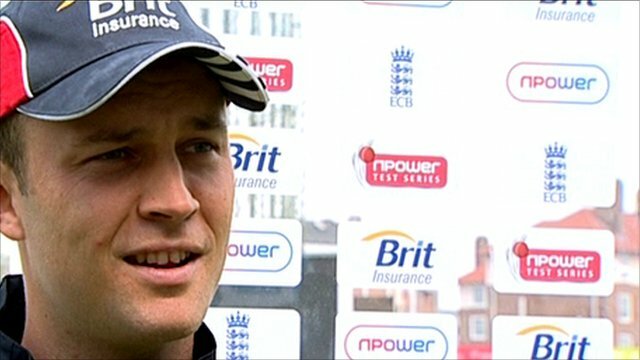 In Bell's absence, it was feasible that Jonathan Trott could have been promoted from number three to replace Cook, with Ravi Bopara possibly being recalled to the middle order. A proven batsman is out of touch - isn't the worst thing we could do is play him on two bowling tracks and then drop him? However, The Oval promises to be a more helpful surface for batting and Miller explained that, with their team on a roll, the selectors were reluctant to tinker. "We back our players and we want then to continue on the road that they're on," he told BBC Radio 5 live's Sportsweek programme. "They're playing really well having won six matches on the trot. "We've got a series to win, and now is not the right time to be making drastic changes." Tim Bresnan has once again been chosen as bowling cover ahead of his fellow Yorkshire seamer Ajmal Shahzad. Bresnan will join the squad in London on the eve of the Test on Tuesday only, rejoining a county match against Durham at Chester-le-Street, which starts on Monday, if he is not required for the Test. Meanwhile, Pakistan's hopes of running the rule over their fringe players in a two-day match at Worcestershire were scuppered by rain, with the contest abandoned as a draw on Saturday. The tourists must choose a replacement for seamer Umar Gul, who is likely to miss the rest of the series after tearing a hamstring during the nine-wicket second Test loss at Edgbaston. Wicketkeeper/batsman Zulqarnain Haider, who made 80 on his Test debut in Birmingham, is doubtful for The Oval with a finger injury.